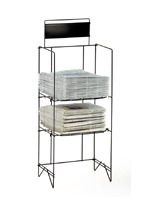 These Newspaper Racks are an Economical Solution for Selling Paper Publications! Shop the Online Catalog for All the Sizes and Styles! 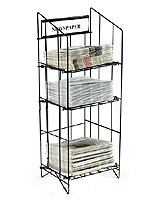 These Newspaper Racks are Going Fast! 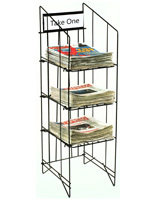 These newspaper racks are appropriate for any retail setting. Each unit has two different tiers for "broad sheet" style newspapers, like the Wall Street Journal for example. 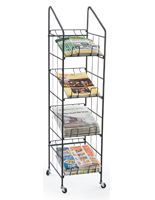 These newspaper racks, also known as high quality display stands, are crafted from heavy gauge steel wire that is finished with a gloss black powder coat. The stands are shipped knocked down in (5) separate pieces. 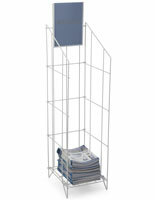 This way, the newspaper racks can ship at a lower cost. In addition, the assembly is completed in just a few minutes. 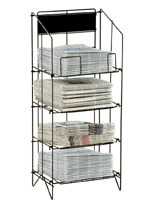 The newspaper racks are sturdy enough to accommodate many papers, tabloids, and publications without bending. Each is outfitted with a black sign plate, so users are able to insert a custom label. The holder allows for 14"l x 4-1/4"h signage, which is sure to grab the attention of shoppers. 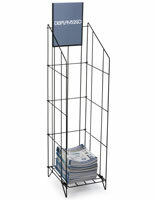 The newspaper racks are extremely economical yet conserve valuable floor space. Why wait? 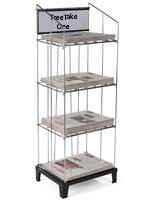 Order the newspaper racks online before they run out! 15.8" x 43.0" x 17.5"